Several years ago when we lived in Ohio I planted a new lawn area I knew I would never be able to water after the grass became established. (I was able to keep it watered to get the grass seed going.) I planted Scotts Turf Builder Heat-Tolerant Blue Grass Seed. This mix contains three turf-type tall fescues along with Scotts exclusive Thermal Kentucky Bluegrass. The bluegrass provides spreading capability (new plants from existing plants) that you don’t get with tall fescues. This also helps with disease resistance and recovery. Thermal Blue is not just any old bluegrass. The plant breeders were after heat and drought tolerance when they developed it. There may be a different grass seed blend that is right for your conditions. Click here to figure out which Turf Builder Grass Seed Mix is right for you. You simply select the mix that matches your conditions: sun, shade, mix of sun and shade, high traffic, heat-tolerance, etc. If you have just a few bare spots, click here to figure out which Scotts EZ Seed Blend will fill the bill. I am planning to reseed this Heat tolerant next week in Southern Massachusetts. But the day temperatures are in 80s and higher 70s. Should I wait for few days for temp to fall in lower 70s or should I go ahead and reseed? Hi Joe No need to wait. The grass seed needs the warm soil to germinate and you want to get as much growth as possible before winter. Just keep your new grass seed watered until established. Thanks Ashton! What is the germination time of the seeds contained in Heat tolerant blue mix? Hi Joe… You should start seeing some germination around 10 to 14 days. Germination is faster in fall than spring because soil is warmer. I started with your schedule you provided me. On Aug 31 I had my yard aerated and then I over seeded with Heat Tolerant Blue. I then followed up with Scotts Started Fert. I set my irrigation to water 4 times a day 4:30, 10:30,2:30 and 6:00. Each time they run it is about 5 minutes a zone. Things seem to be staying moist. My question is, is that enough water too much water? Thank you for your help. Hi Todd… If the top inch or so of soil is moist your seed should germinate fine by around 10 to 14 days after seeding. Once you have good germination, you will want to lengthen the time between watering and water deeper to encourage deeper roots. The ultimate goal is a half inch of water from rain or irrigation twice a week. A rain gauge will tell you how much rainfall you are getting and when placed on your lawn while the irrigation is running you will be able to tell how long to run each zone to get a half inch. I applied Heat tolerant seed today after aerating the lawn myself. It was very labor intensive. I did not get time to apply starter fertilizer today. Can I apply it tomorrow? Is it going to affect seed germination if I apply it after one day. Hi Joe… You will sleep good tonight! You can feed with Starter tomorrow. I have some bare spots on my bermuda lawn in georgia my that i would like to reseed this fall. What would be the ideal temperature be for this? Hi Brian… Late Spring/Early Summer is the best time to seed Bermuda Grass. Young seedlings would likely not have enough root growth before going dormant in Late Fall/Early Winter. Can I plant this in Columbia SC? Yes, you can plant Heat-Tolerant Blue in Columbia SC. Your location allows you to grow a wide range of the warm-season grasses: Bermuda, Zoysia, Centipede and St. Augustine. These grasses typically go dormant in winter (turn brown). They also prefer full sun, however some of the newer Zoysia’s that can be seeded can take some shade. The Heat-Tolerant Blue blend is mostly turf-type tall fescues with a small amount of Thermal Kentucky Bluegrass. This grass is going to do best in the cooler time of the year (green in winter). It also can tolerate quite a bit of shade. Early fall is a good time to seed this blend. Yes, the Heat-Tolerant Blue grass seed blend can be planted in your area. However, I would lean toward the Scotts Pacific Northwest blend for the Willamette Valley. 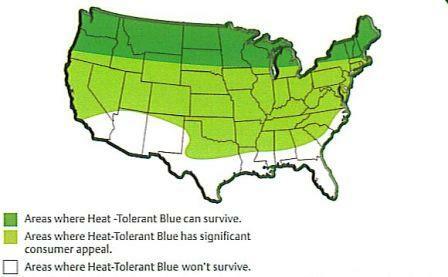 Here is a link to info: https://www.scotts.com/en-us/products/grass-seed/scotts-turf-builder-grass-seed-pacific-northwest-mix The Heat-Tolerant Blue could be a good choice east of the Cascades, especially in Southern Oregon. Early Fall is a great time to plant.